Safe patented lip tint the latest lip craze trend in Korea for girls who love long lasting vivid colors. 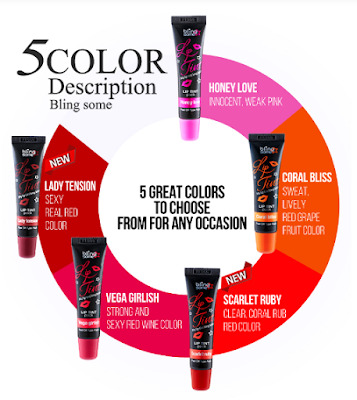 Available in 5 shades - Honey Love, Coral Bliss, Scarlet Ruby, Vega Girlish, Lady Tension. Initially I thought the peel off lip tattoo is another gimmick Korean beauty products. It is only fair for me to try it first before passing any pre-judgement on it. So I picked up the Blingsome Lip Tattoo from Althea to try. It wasn't love at first sight. It took me three trials to get it right. From the tube, apply the product on to the lips. The texture is jelly-like and will dry up after 10 minutes (depending how thick you put). Peel off the film once it dries up. Do a pat test first before peeling it off. If there's wet patch it wouldn't peel off and will cause a mess to remove. Let's talk about the downside of this product. It is not easy to peel as shown on the advertisement. When applying directly from the tube, it tends to get messy because the texture of the product is thick and sticky. It is really hard to get the precision right. The opacity of the colour depends on how thin or thick you apply it. If you have dry or chapped skin on your lips, it will be peeled off, leaving a patch of uncoloured area (as you can see in the photo below). The first time when I was trying to get it right, it got transferred to my teeth. Due to the drying time, this product is not recommended if you're on the rush. I don't like the application part of this product, but I definitely love the results. As I said, it took me three trials to get it right. What I love the most about this is the longevity of colour. It stays for 12 hours! It doesn't stain my cup and it is kiss-proof. So you don't get that icky feeling of having lipstick on your lips (no hair sticking on the lips, yay!). I love the colour as well. The one I have is in Scarlet Ruby. It is a chilli red colour. To reduce your makeup time, put it on before sleep. The colour stays till the next morning and it saves you some time to prepare before you head out. Make sure you leave it dry completely before peeling it off. Leave it on extra 10 minutes just in case some parts are still wet. To avoid the colours get transferred to your teeth, put on the outer part of your lips only. Remember to exfoliate your lips before applying. Make sure you do not have dead skin or chapped lips. This product requires a bit of time to get used to. Once you can get over the hassle of applying it, you will love the it. It doesn't stain or fade and is perfect for traveling, swimming, or any kind of sports. It would be easier to apply if the tube has an applicator like a brush or doe foot wand. It will be easier to control the amount and get the precision right at the corner of the lips. That is definitely something which the brand can improve on. Other than that, the formula of the product is really good. I think this product will garner extreme opinions. It is either you love it, or hate it. If you decide to give this a try, you can get it from Althea. The original price is RM79, but Althea is selling at only RM30. 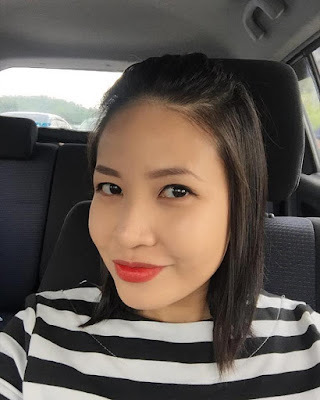 Do use my referral by clicking <<here>> to get RM5 additional discount and RM30 new member discount when you make your first purchase. I do not earn any commission from Athea but Althea will credit me 10 points for every successfully referred member. The points will be use on product redemption. And this is not a sponsored post. I reserved my own opinion on the product.